26 New Directors | 26 New Ways to Die! 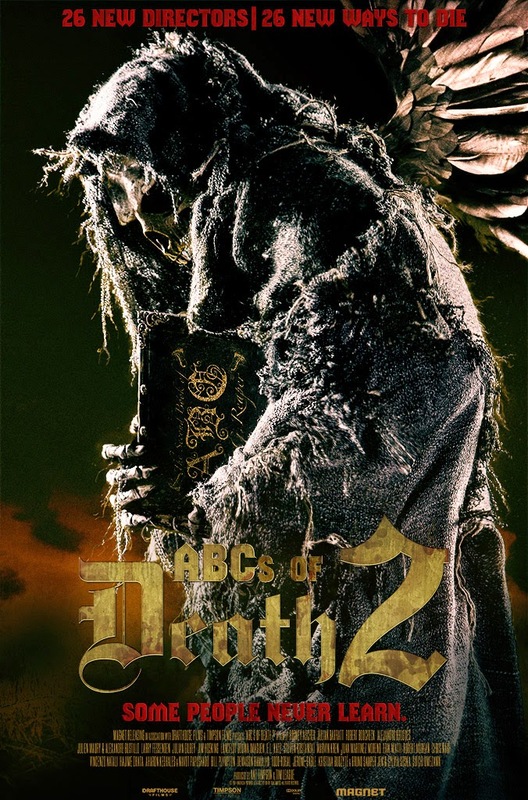 For those of you who liked 2013's bizarre, disturbing, sometimes hilarious, short attention span horror movie 'The ABC's of Death 2' is on the way! The follow-up features segments directed by over twenty four top contemporary horror filmmakers around the world. The film consists of twenty-six individual chapters, each by a different director assigned to a letter of the alphabet. The directors were then given freedom in choosing a word to create a story involving death. How will they top "F is for Fart" from the first one!?! On October 2nd the film will be available on-demand/itunes and in select theaters October 31st. the follow-up to the most ambitious anthology film ever conceived with productions spanning from Nigeria to UK to Brazil and everywhere in between. It features segments directed by over two dozen of the world's leading talents in contemporary genre film. The film is comprised of twenty-six individual chapters, each helmed by a different director assigned a letter of the alphabet. The directors were then given free rein in choosing a word to create a story involving death.